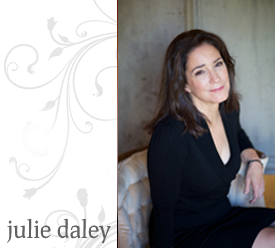 I followed Julie’s blog Unabashedly Female for about a year before I began working with her. The blog is a perfect reflection of Julie herself – lovely, complex, wise and deeply concerned with bringing more feminine energy – in all it’s manifestations – into the world. When I reached an important threshold in my life, I asked for her support to help me understand how to trust in and call upon that feminine energy within myself. I found Julie to be a teacher in the best sense of the word – a seeker dedicated to helping others toward even greater self knowledge. She has a well honed sense of intuition and seemed to always know when to interpret, when to encourage and when to confront. As I look back on it, it is clear that she played the role of midwife during this intense period – helping me invite and usher in what previously seemed impossible. ~ Betsy P.
Working with Julie as my coach over a period of several years was a privilege. She brings to her work such integrity, presence, skill, and love that I felt the wonderful balance of being challenged to grow and at the same time safely held. Her deep spirituality touched all that we did together, even when I hoped to achieve very tangible, practical goals. Through the coaching I have been able to experience a greater sense of wholeness, and living more fully in harmony with my values. I have learned to discern what is true for me and value the sacredness of my feminine self. I have been receiving coaching from Julie, and I have to say that since working with her, my personal growth has accelerated at rates that astound me. My recent schooling has conditioned me to assess improvement through measurable outcomes, and there have certainly been no shortage of these since joining Julie in a coaching relationship. Since beginning my work with her, I have fulfilled a dream of living abroad, given up a self-destructive relationship with alcohol, taken a leap in moving across the country, leaving my former occupation behind to attend graduate school and embark on a more fulfilling career. Each of these milestones would have been unthinkable to me prior to knowing Julie. It was absolutely her loving support and incredible coaching that pushed me to make such bold moves. But at least as valuable to me as the tangible outcomes are the subtler, less measurable shifts that have come out of the work I’ve done with Julie. Since beginning coaching, I have a greater sense of trust in myself, a respect for my own wisdom, and a deep commitment to continue this lifelong journey of knowing and loving myself. In addition, I have come to view myself as someone who takes risks and faces fears, and my confidence has improved dramatically from it. “I hired Julie to deliver a customized off-site training experience to help our marketing team overcome creative obstacles. I’m pleased to say that she exceeded our expectations across the board. We started with a very nebulous set of goals, and Julie immediately jumped in to help us refine and prioritize what we could reasonably accomplish. As the date of the offsite drew nearer, the trainees were very skeptical about what the training was all about and what the results might be. Julie deftly overcame these negative perceptions and turned the team’s skepticism into enthusiasm within the first couple of hours. By the end of the day, the team was in high spirits, delighted with the tools that Julie provided and the exercises she led in helping us to identify and engage the barriers to our creative success. “As always, Julie’s writing takes me to a place that I, long ago, learned to avoid – and this post addresses this ‘place’ and the subtle terror (if terror could ever really be subtle) I feel when I approach it. It’s a wildness that lives in every cell of my body; and which, I learned to silence, when I was too young to understand that it was happening. Once silenced, once habitual, it became virtually impossible to re-open; because, though I sensed it’s shadow shape in the emptiness it left behind, there was no one who could name it for me. So many women hold this shadow shape inside. “When I first met Julie, it was through her blog. No matter where I was, I’d read something Julie posted and say “Yes, Yes. Me, too. Me, too.” right out loud with the enthusiasm best conveyed by all caps. With exclamations subsided somewhat, I’d pen a comment that might be up to twice as long as her post – Julie’s work just resonated with me that deeply. ” I run into your blog and immediately fell in love with your wisdom and the way you weave it into your beautiful words. I’ve read most of your blogs and especially love “So many Silences”, “Old Woman Wise Woman Powerful Woman”, and “The You That Takes Your Breath Away”. I could identify with you in so many ways. Those articles also helped me articulate many feelings that had been oppressed for a long time….You had a part in helping me realize my dream. I really want to let you know my deep appreciation.